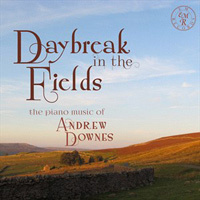 ANDREW DOWNES (b.1950): Piano Sonatas No. 1 and No. 2*, Sonata for 2 Pianos, Sonatina*, 7 Preludes*, In Memoriam Herbert Howells*, 7 Postludes*. * - First Recordings. Description: Attractive and approachable piano music from a composer of whom his teacher, Howells, thought highly. The Preludes and Postludes are descriptive pieces where perhaps the influence of Howells is most appparent. Musicweb International’s review states the case for the sonatas: “...it is the sonatas that make the deepest impression, and especially the Sonata No. 2 which was composed for the present performer. The longest work on the disc [38 minutes], the Sonata is influenced by the writings of Thomas Hardy, especially the second movement which employs thematic material from the composer’s Hardy song settings. It is a richly rewarding work. Although rooted in the English pastoral idiom, it has a darker and at times more menacing texture too, one that brings to life the full nature of Hardy’s characters. In comparison, the earlier Sonata No. 1, less than half the length, opens with a more relaxed music which gives way to a more intense faster music. This sonata is in a way cyclical, as this thematic material reappears in the final movement.” 2 CDs. Duncan Honeybourne (piano), Katharine Lam (second piano).